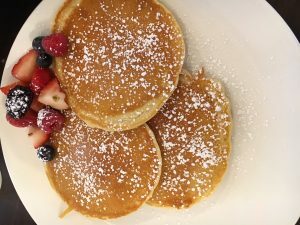 It was about two years when I last had brunch in Juniper, the restaurant in The Fairmont Hotel in Washington, 24th, and M. I told anyone who would listen that I would soon return because I just had the best pancakes ever. OK, it’s been two years but I got there. They are served with maple syrup, not from a bottle, fresh fruit and, are you ready for this, the flour is imported from France. I didn’t care where it came from, they were a lot better than from any other pancake I’ve had here on earth. I know what you’re thinking, Eddie it was a pancake. A pancake for goodness sake but you haven’t had them so stop complaining. It must be that flour from France. Or another reason perhaps, it was served to me by a professional server in a lovely restaurant in a lovely hotel. Let me move on. There are of course other menu items. I was told three of the more popular are the Brioche French Toast, Cedar Plank Salmon and the Omelets. Small plates like Juniper Salad, Virginia Cheese & Charcuterie are also offered. Juniper serves a breakfast buffet (7-11), brunch on Saturday and Sunday (11-2), no dinner service Sunday and Monday. It seats about 80 with a small semi-private dining area. If you drive there, pull up to valet and they will validate a portion of the parking. Good luck finding street parking. Saturday and Sundays you can enjoy High Tea from 2 to 4 p.m. Here you are offered a selection of about 10 teas and food. Reservations are required for this ($40.00). If you’re there for dinner (Tuesday-Saturday, 5pm-10pm) you’ll want to know a few of the signature dishes include the Seafood Paella, Cedar Plank Salmon (larger order then brunch), Sauteed Sea Scallops and Grilled Lamb Chops. By the way, the chef is from Spain. I need to go back and try some of his dinner options. From what I hear Juniper serves many locals, not just hotel guests. That is a very good indication of the quality of the food. By the way, the family can visit Santa’s Suite weekends in December. The hours are 11am-3pm). It’s on the 9th floor. You’ll, of course, find Santa and treats. You can also write Santa a letter. Reach the hotel at 202-429-2400 or go to washington@fairmont.com. ← How Is Amazon Heating Long Island City’s Housing Market?